Public Policy Polling: Do over? We'll have our full poll on the Wisconsin conflict out tomorrow but here's the most interesting finding: if voters in the state could do it over today they'd support defeated Democratic nominee Tom Barrett over Scott Walker by a a 52-45 margin. The difference between how folks would vote now and how they voted in November can almost all be attributed to shifts within union households. Voters who are not part of union households have barely shifted at all- they report having voted for Walker by 7 points last fall and they still say they would vote for Walker by a 4 point margin. But in households where there is a union member voters now say they'd go for Barrett by a 31 point margin, up quite a bit from the 14 point advantage they report having given him in November. A big part of Scott Walker's victory in November- and Ron Johnson's as well- was Democratic voters sitting at home. Our final pre election poll in Wisconsin found that likely voters had supported Barack Obama by only 3 points in 2008, in contrast to his actual 14 point victory in the state. Those sleeping dogs aren't lying any more though and when you combine the reinvigoration of the base with GOP union households trending back toward the Democrats, Walker seems to have severely hurt his party's chances of building on their gains from 2010 next year. For all of his delusions, Walker has one real connection to Ronald Reagan: he has ended the era of the Reagan Democrat. Thank you! It's amazing to me that 45% of Wisconsin would vote again for this fool... what's wrong with people? Seriously folks: The Republicans are NOT on your side! When will you get that through your heads!? Tell that to the Tea Party. So, a poll was taken of Democrats, yet somehow this poll tells us how Republicans would vote? This is the logic used by Democrats? The world does your bidding? People vote the way you say they will? Actually, you may think that, because that may have happened in the past. But the key word is "past". I think you are about to find that those days are over. I think you are able to find that people have "wised up" and found that listening to fake and/or skewed polls is the worst thing they can do. I think people have finally realized to make their voice be heard, no matter what the "polls" say. They did this November. And, they found out -- wonder of wonders -- the polls were ..... *gasps* wrong???? Keep up all that crazy talk of "communist agendas." It does wonders for discrediting the reactionary Fox right! I think that the most effective commentary, from Cicero to Royko, IS DONE IN ALL CAPS!!!! Wow, "Truthman" - really? A "Communist" agenda? You might want to read up on those terms that Faux News has been shoveling into your ear before you start using them. You might just learn something. Sadly, those of us who knew this would happen and voted against Walker in the first place have had to watch with incredulity as others belatedly wake up to his shenanigans. First - thanks for the laugh over your name. McCarthyism rears it's ugly head whenever people are too illiterate, or lazy, to educate themselves and accept the hate filled blather of sheep herders. Joesph McCarthy was shown to be nothing more than a fear mongering lunatic in search of an extended 15 minutes of fame, or in his case infamy, when he screamed Communist everytime someone disagreed with him. I am quite aware of his undoing because the person who eventually stood up to him and ended his reign of terror, Sen. Margaret Chase Smith, was from my state. Now go read up on what all those adjectives you teabags like to throw around actually mean. C'mon Tom, why do you consistently push the argument that someone cannot improve their numbers? Obama's numbers fell pretty dramatically last year and they recently went back up. Isn't Obama the best example of how someone's numbers can go up and down? Now that's a great way for Repubs to turn on their leader--realizing they'll lose in 2012...let the game begin. 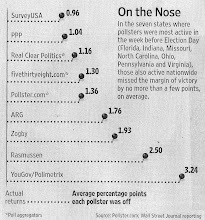 PPP = The most accurate polling company, massively better than Repubmussen. WHEN REPUBLICAN POLITICIANS SHOW YOU WHO THEY ARE BELIEVE THEM. Do you believe them now... they gave you poverty and an Unnecessary and Illegal War up under Bush, so that Cheney's Company Halliburton could make Millions of Millions of Dollars off of Cheney's orchestrated US No-bid Contracts in Iraq and Afghanistan... NO-Bid Contracts, does that sound familiar.. Isn't that what the current Governor in Wisconsins is doing with the Koch Brothers. ...And Voters turned around and allowed Republicans to do it to them again. Will you finally learn in 2012. WHEN REPUBLICANS SHOW YOU WHO THEY ARE, WILL YOU BELIEVE THEM NOW! since truthman has resorted to shouting the 'Communist' tag at those of us who believe in preserving the dedicated American public service workers' hard-earned right to collectively bargain for pay and benefits from sleazy politicians who will run right back to the good ol' white boy private business sector the second their 15 minutes of fame is over we wish to remind everyone that truthman is a big wussy-wuss whose mama wears army boots, has gorilla fur on her back and still has to change truthman's diaper 27 times a day because he's so full of . . .
Darn, I would have bet on the Packers. No do-overs, huh? Tell that to Gray Davis. Scott Walker will be Wisconsin's first 1/4-term governor and a stain on our illustrious political history. My feeling here in Milwaukee is that a recall of Walker - which would require over 500,000 signers - will be highly successful. Really? No do overs? Scott Walker got elected to county exec due to a recall. Sample appears seriously skewed. 47% say voted for Walker, but reality of election result was 52.3% so seriously underweight Walker voters. Also, sample is 32% from union households, but only 26% in Wisconsin from union households, so overweight union households. "What do you make of the self-reported even split in the 2010 vote (47 Walker-47 Barrett)?" Without the GOP-heavy turnout, naturally the self-reported vote would favor Barrett more now. As I understand it, the legislation doesn't strip all collective bargaining rights for state works, correct? Also, there is a great deal more to the bill than just this provision. I frankly think Walker should probably compromise... but not in any way that will not achieve the result of making the state solvent. I think one thing people don't seem to understand is the word "BROKE." Public pensions are bankrupting localities and states across the nation... nowhere more than here in California, where increases in compensation were made retroactively, against the state's constitution. This stuff goes on all over the place, as politicians have padded the pockets of government workers in order to buy votes. Our country simply CANNOT continue down the road it's on. Public pensions/liabilities are at a crisis point, and states will start going bankrupt if DRASTIC changes are not made. This is a bone being thrown to a totally demoralized Democrat constituency. The polls demographics are hopelessly skewed and have under weighted Rep voters by a wide margin. Polling is only as legitimate as the ones who administer it. Hell, I could take a poll today and by selectively calling the necessary areas I can get you literally any response you want. There will be no response. You have introduced facts into this discussion and facts will cause a Liberal to become distracted, anxious and angry because they cannot use their pre programmed talking points to respond. Truth to the Left is like light to a Cockroach, both will run for cover when it appears. Anyone notice PPP polled 20% more women then men? LOL, what a FARCE this Left leaning outfit is. Once the Unions are trounced in this matter, as they will be, and the budget becomes balanced and things improve these numbers, skewed as they are by improper demographics will swing rapidly and far to the right to favor Walker. Just look at NJ to see how Christi has done with his taking on of the Unions. They have been completely marginalized and he has balanced the budget with NO tax increases in just ONE YEAR. The people love him, all except for the greedy Union minority. "So, a poll was taken of Democrats, yet somehow this poll tells us how Republicans would vote? This is the logic used by Democrats? The world does your bidding? People vote the way you say they will?" Where did you get the notion that only Democrats were polled? Do they actually allow people who can't read to teach elementary school in Arizona? Never mind--the ironically rhetorical nature of my question just dawned on me. Since you're so keen on "do-over" polling, for your next trick, try polling the US on whether they'd vote for Obama if given the chance again. This whole budget bill fiasco has created a middle class versus middle class battle. Who wins-of course-big corporations, the insurance companies and now-big government in Wisconsin. Walker is trying to control non-budget items that would give him control of programs and state assets without the checks and balances and transparency that we need to keep politicians at least a little accountable to ALL taxpayers from whatever political group they are in. Wake up people-have you read the budget repair bill? Do you really know what he wants to do? Is he listening to all of the people in Wisconsin, or just the people that agree with him or supported him with money during his campaign? Public and public sector people pay taxes-are we forgetting that very basic simple fact? "Sample appears seriously skewed. 47% say voted for Walker, but reality of election result was 52.3% so seriously underweight Walker voters. Also, sample is 32% from union households, but only 26% in Wisconsin from union households, so overweight union households. Any response Mr. Jensen?" Of course, there will be no response. These guys are in the "meme pushing" business rather than the polling business. What else would you expect from a Daily KOS sponsored entity??? I've noticed something strange since the 11/2 election: Almost all Daily KOS/PPP polls since then have been favorable to Dems. It appears that since PPP are the only ones polling regularly these days, and the election is almost 2 years away, they can jigger the numbers to get the results they want - Knowing they will not be called to account until everybody else starts more polling. In other words, they have the field to themselves to push Dem leaning story lines now, but will have time to adjust their results later to be more in line with everybody else. What a farce this outfit has become. Why did a very recent Rasmussan Poll show 70+ % of Wisconsins backed the Governor? Think I'll trust that Poll. I would love to hear the response to this question also. Well ??? Yeah, Rasmussen will gladly fit you with a comfortable set of blinders. National participation in unions is approximately 10%; households in this poll registered 45% union membership or 344 people out of 768... this poll is not an accurate representation of the public. not getting into the stone throwing, but if it comes to be that the unions are crushed, all of us in this country will regret it. Most of the "improved" work conditions we enjoy today, are DIRECTLY a result of the unions. Without their existance, our working Americans will all surrender to the wealthy business leaders.I just keep hearing the words from Pres. Bush, after 9/11. He asked for all of us to UNITE,for only in UNITY could we be sucesful. I guess that doesn't apply to the middle class when they UNITE for the good of all working men and women. "National participation in unions is approximately 10%; households in this poll registered 45% union membership or 344 people out of 768... this poll is not an accurate representation of the public." Where are you getting 45% from? It's 32%. And union membership in Wisconsin, sort of the birthplace of unions, is higher than in the country as a whole. As Jessie Jackson so apptly stated "Tea Partiers are Turkeys sitting at there own Thanksgiving dinner." Tea partiers must be made up of people who have no young children in school, don't care about the enviroment, and think millionaires should get more tax breaks because they do not have enough money. "ONCE AGAIN PUBIC PUKES POLLING IS SHOWN TO ENDORSE THE COMMUNIST AGENDA"
Ah, the opposition. That's quality, that is.